The king arrives to congratulate Grammont for his victory at Dettingen ( honoursofwar.com/thread/452/dettingen-1743-large-battle ). 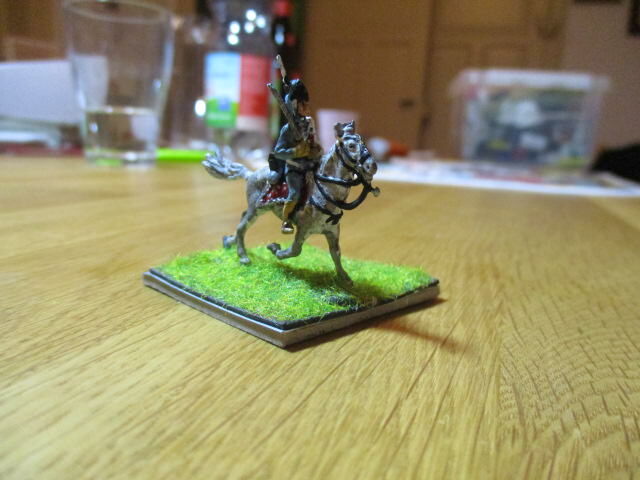 The model for the king is a austrian fieldmarshall from Art Miniaturen by Schmäling. 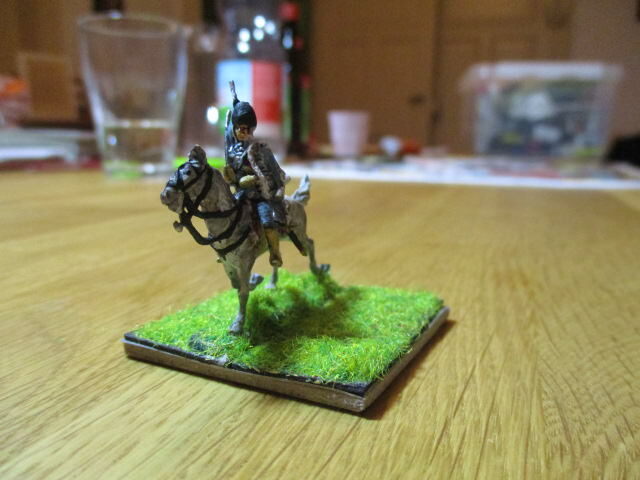 His Bodyguard is by Zvezda and was a swedish artillerymen, his horse is from the swedish dragoons by Zvezda too. For the king I followed a painting by Pierre Lenfant. The men from the gardes du Corps is according to a sketch by Gudenus from 1735 (and disregards the Reglement). Oh, I forgot to post here my last unit. Perhaps because the Forum became a bit silent. 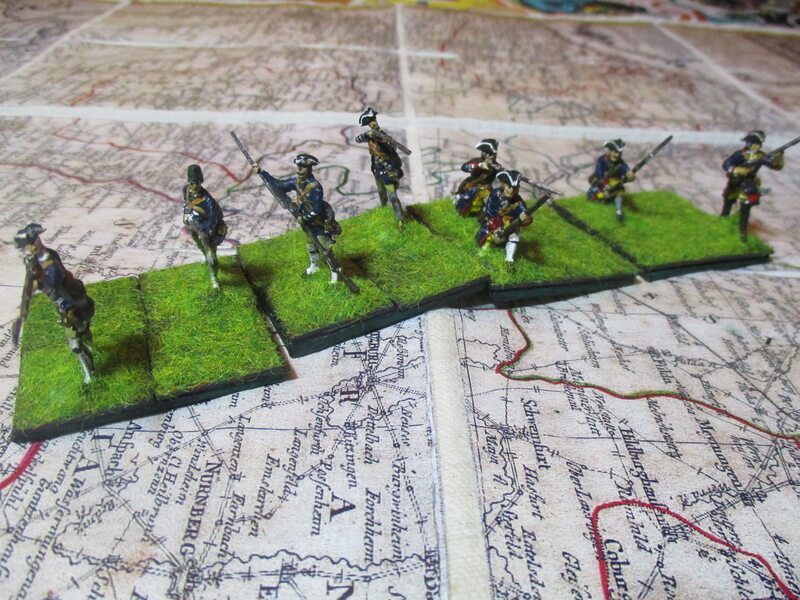 More French light infantry today. These are the Compagnies Franches Noble and Chemin. I don't know any Details about These Units. I think that they were maybe very small Units. 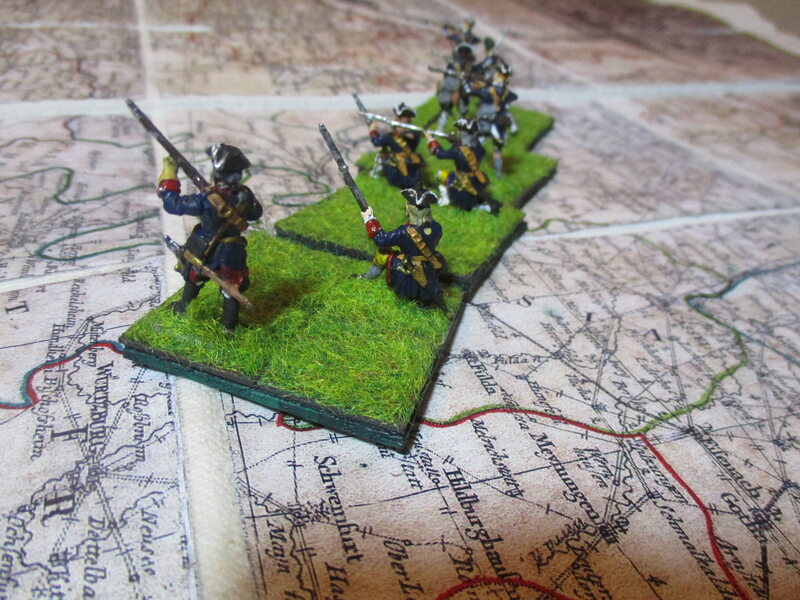 Therefore I decided to use them as one medium sized unit and have the chance to split them in two very small units (like the croats in my Pfaffenhofen refight). I was impressed by two drawings by my dear artist Gudenus, who is my best reference for many Units although the uniforms changes since 1735, when he made the pictures during the siege of Mayence. This unit will represent the compagnies franches at Rocoux. I don't know how well or bad they were. But I opted to rank the arquebusiers de Grassin as inferior light infantry and so will be the ranking for these poor fellows. 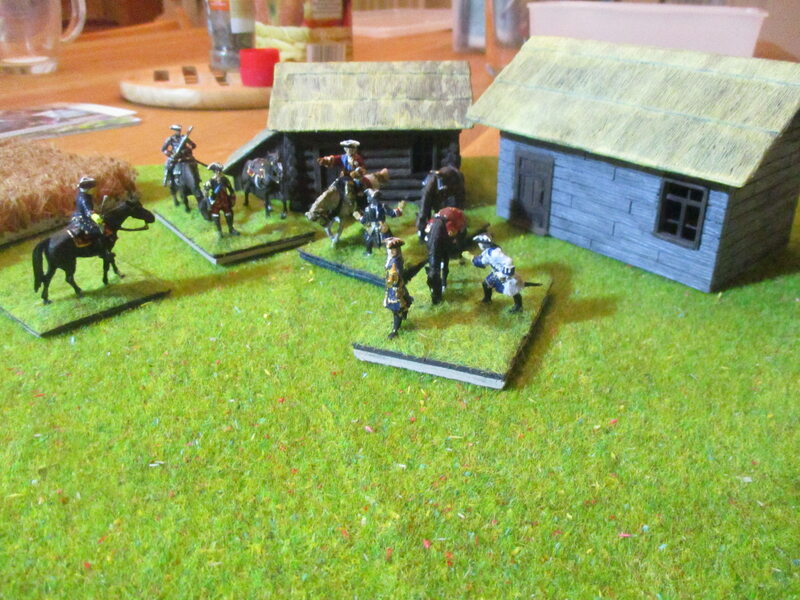 The figures are a mixed bag of Revell and Zvezda miniatures. My beautiful wife said: "oh this poor creature with the bonnet is looking like a skull". 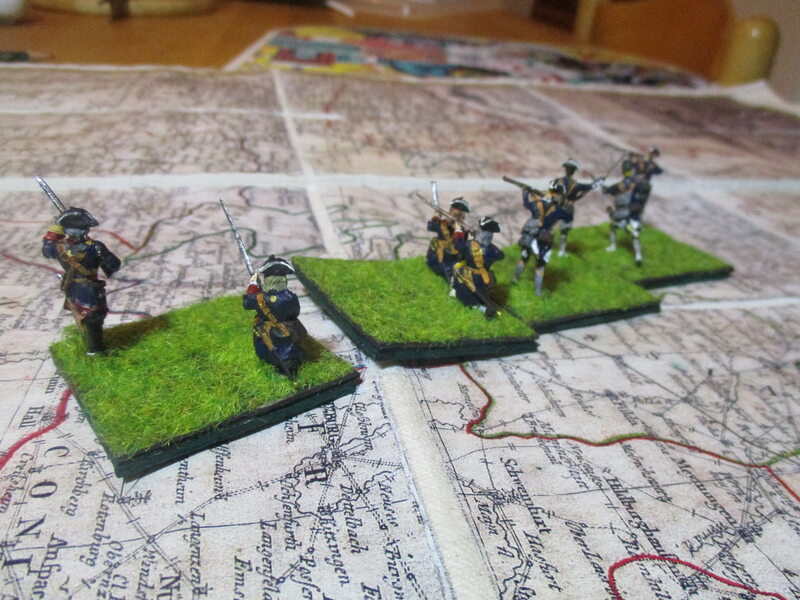 Well, reason is, that the poor set of prussian infantry from Revell was bad and especially details in the faces. On the other hand the light troops on the drawings by Gudenus are really looking miserabel. 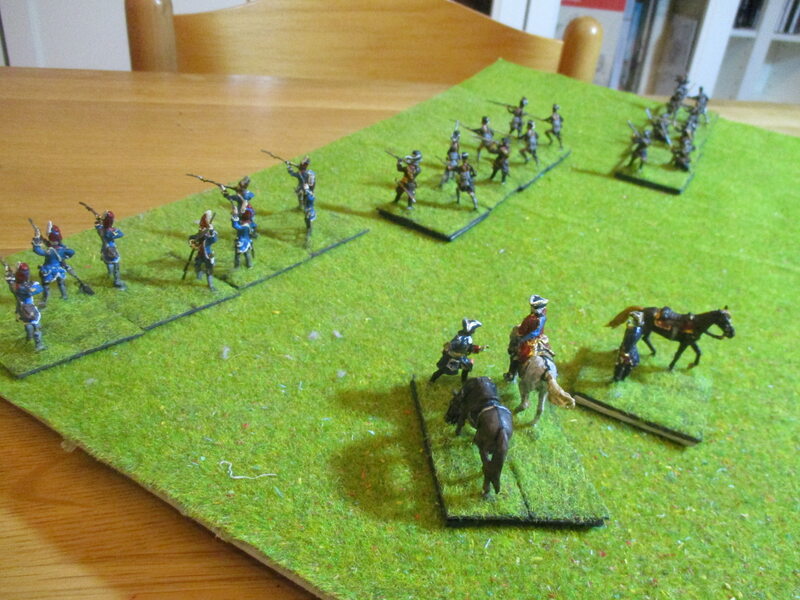 Poor fellows, light cavalry and dragoons with drought nags. I hope you like them nevertheless. It was the time for a small birthdayparty for the king. 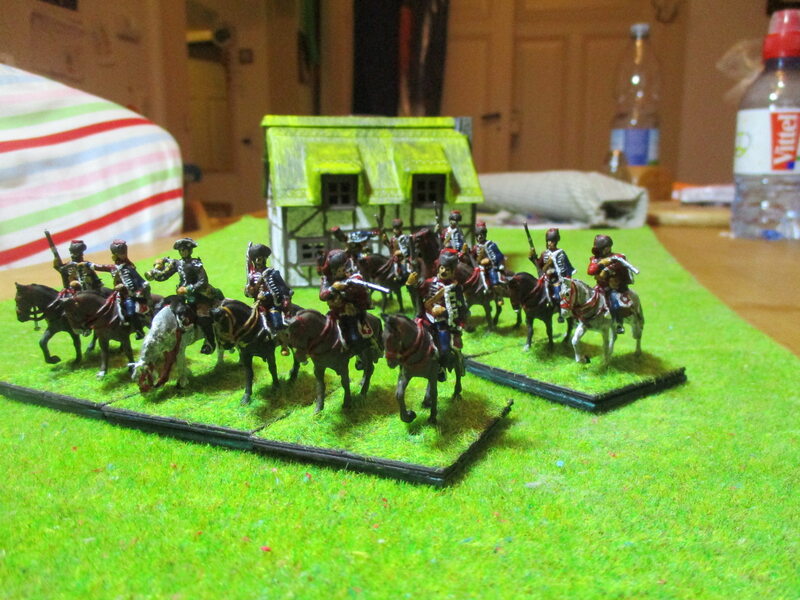 I decided to assembel just the light infantry because I will have to do a lot today for tt in fighting Fontenoy to the conclusion. During the last year I raised 3 bn.s of French light infantry. 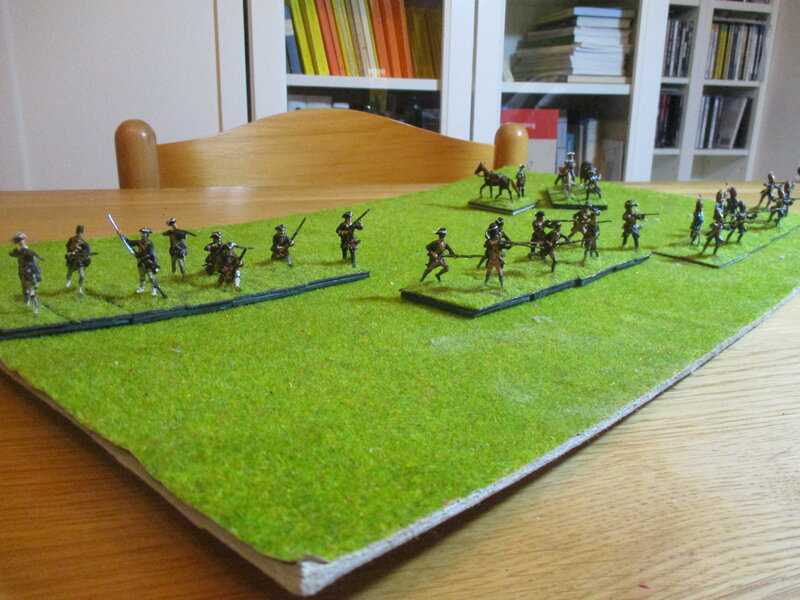 From left to right: a mix of compagnies franches Noble & Chemin, beside in the middle fusiliers de la Morlière (my new unit) and finally and the right the arquebusiers de Grassin. I gave two of the fusiliers de la Morlière boots. One of them should be the officer although he get a musket (don't know if they had muskets). 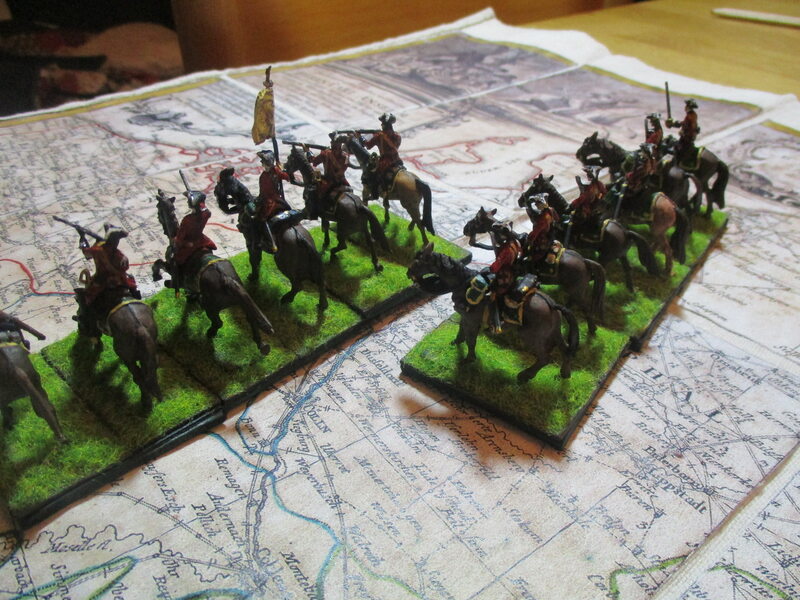 The other could represent the part of these units which was on horseback. In fact I don't know that these Dragons ever fought on horse or played any important role during battle, although the fusiliers de Morlière distinguished themselfs at the battle of Rocoux where they fought at the French right wing along with the arquebusiers de Grassin. I assume that These light troops had a lot of liberty in Dressing and therefor the dragoon get a ordinary hat instead of the exotic headdress here fr.wikipedia.org/wiki/Fusiliers_de_La_Morli%C3%A8re#/media/File:Fusiliers_de_La_Morli%C3%A8re_-_Dragon_XVIIIe_si%C3%A8cle.jpg which is'nt looking practical at all. Wonderful photos thanks for sharing. Thanks for your comments. I'm glad that you like them. Altough they are looking very ordinary and I used very typical figures without much changing and cutting, I prefer my compagnies franches. I'm painting some more French horse these days. Hope to finish them in 2 or 3 weeks. 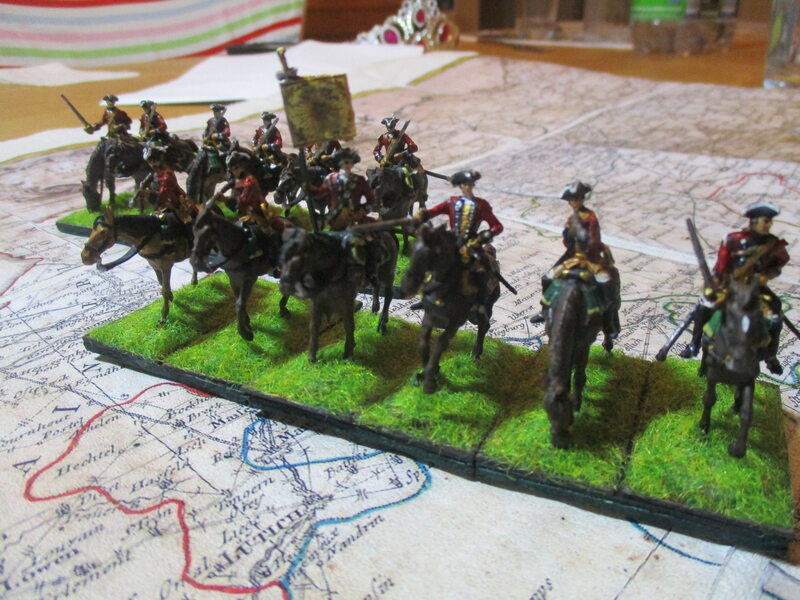 Here we are back with a new Regiment of French Cavalerie légère. I found the Regiment under the name Bétune on a picture by Gudenus and followed him. The uniform looks similar to the uniform of the regiment Fitz James. 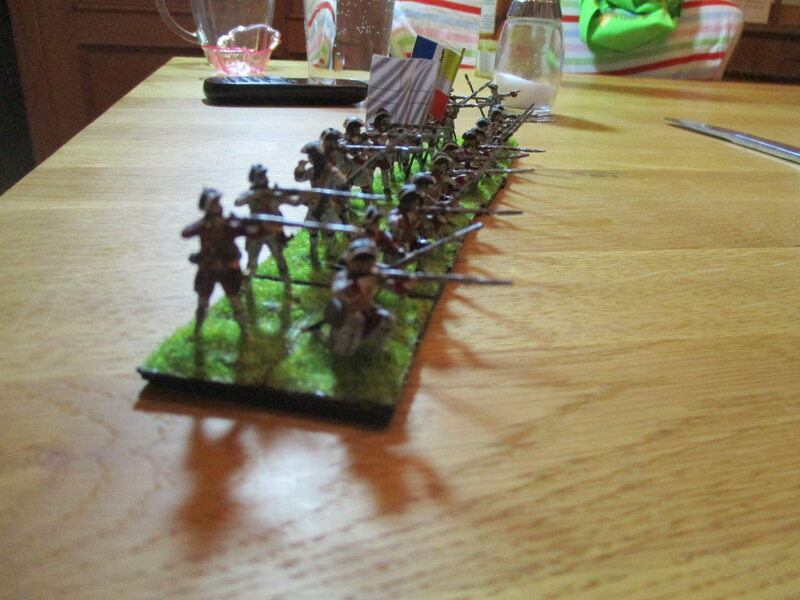 In the early 1740s the regiment took part in many actions with the Name Pons. Later it served as Regiment Harcourt. The "état generale des troupes" of 1748 mentions green saddleclothes. 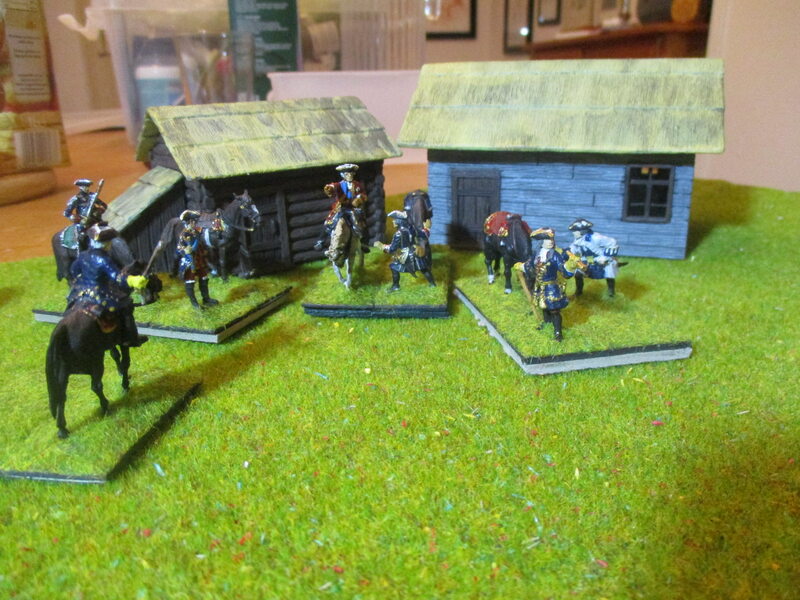 The figures are by Revell, horses by Zvezda and Revell. I decided to paint the old uniform from the pictures of Gudenus, because I don't have contemporary pictures from the 1740s. 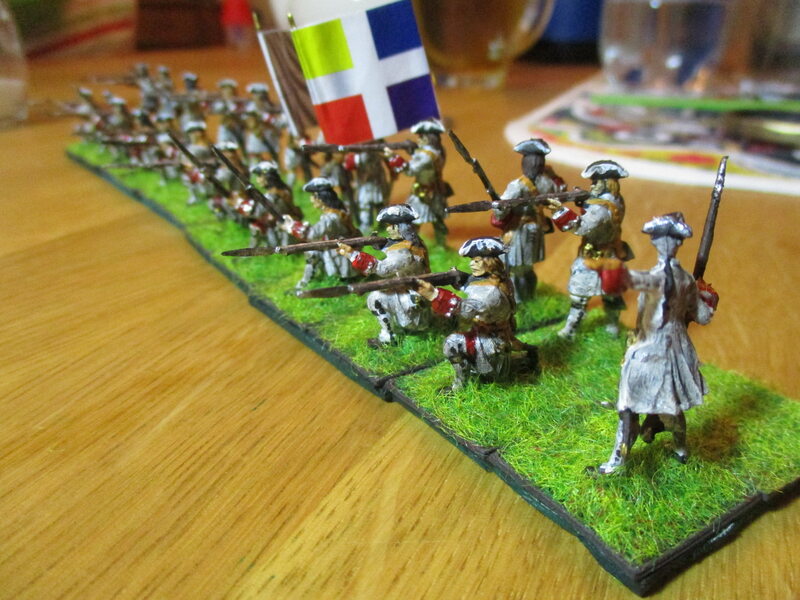 My latest Regiment: La Fére. 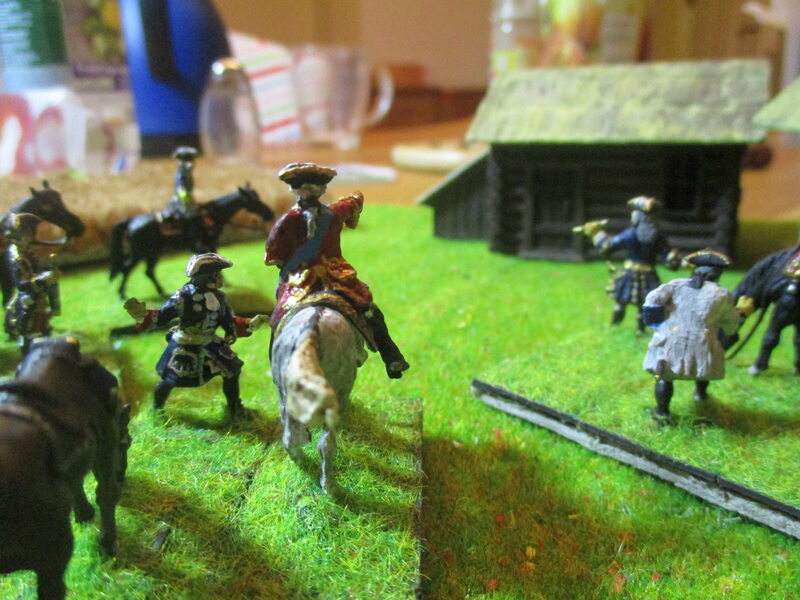 The officer is my Revell with some greenstuff to make propper cuffs and a better tricorne. 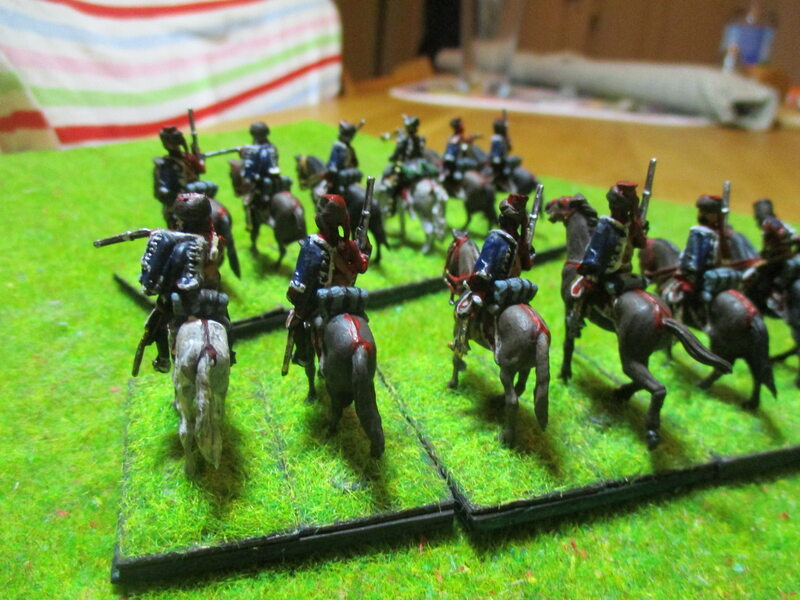 I used some Revell-Minis as Grenadiers in sleeved waistcoats, because the Zvezda-figures don't have sabers. Again, some remarkably good looking units there. 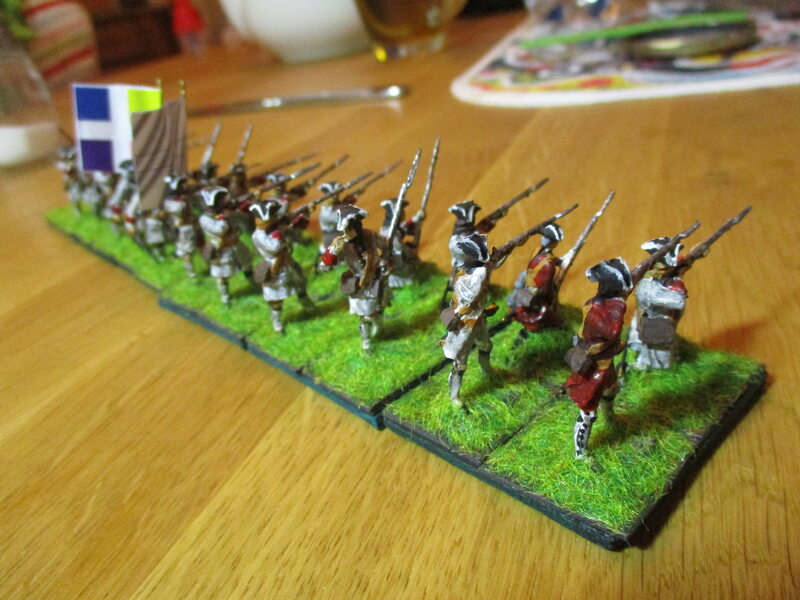 In fact I didn't wanted to paint hussars. But they were present at Suffelnheim 1744 and Rocoux and are therefor a must have. 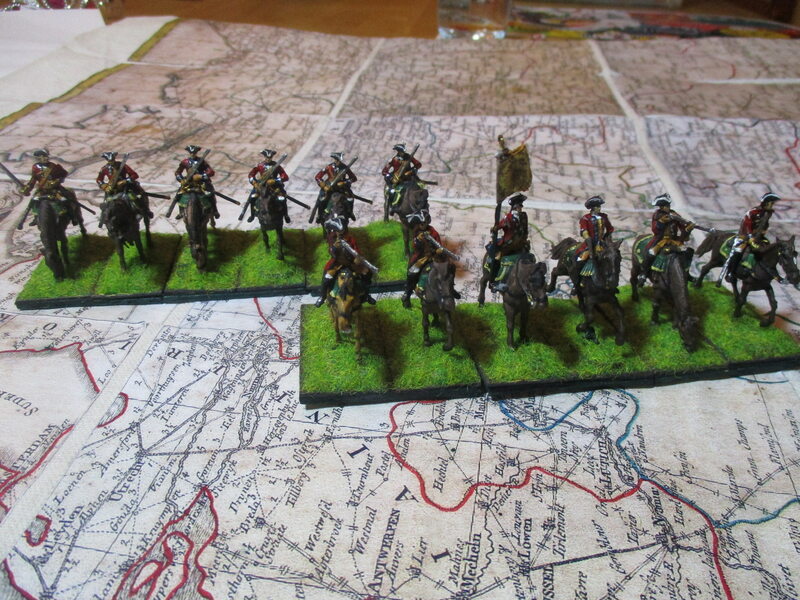 The hussars are from Revell with convertions. The musician is by Hagen-Figuren. They do look a treat. I like the relaxed look of the horses, the officer pointing, presumably saying, “I think the Allemandes are over there,” whilst a couple of troopers check that their carbines are ready to fire. I'm glad, that you like them. 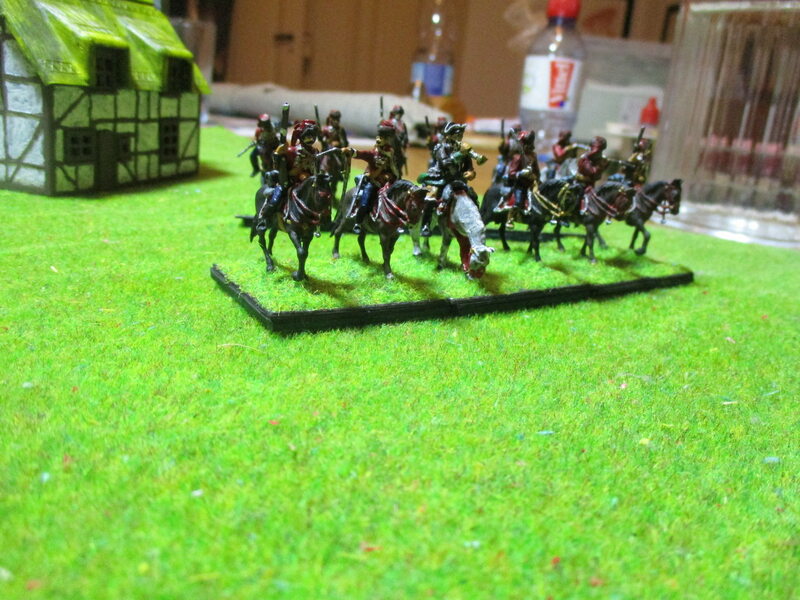 Nice to see some dismounted dragoons in action. Which dragoons do you mean? 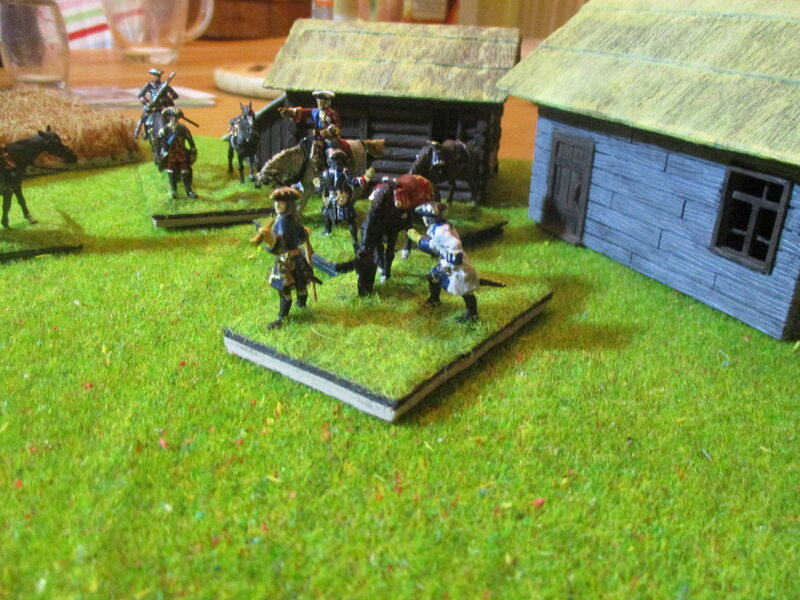 At the top of this page are compagnies franches - altough I used a dragoon-figure for more poses. I think they had a mix of equipment. 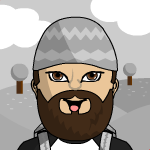 I put some greenstuff at the mirleton to form a bearskin cap. I don't know why Berchény has not the uniform of his own Regiment. I believe that the king allowed him to wear a hussaruniform if he has a ordinary general's uniform too, especailly when presented to his majesty.